audre, is a duo from San Francisco, California. The two members, Jorge Bachmann and Michael Gendreau have been part of the S.F. experimental scene under many different monikers. 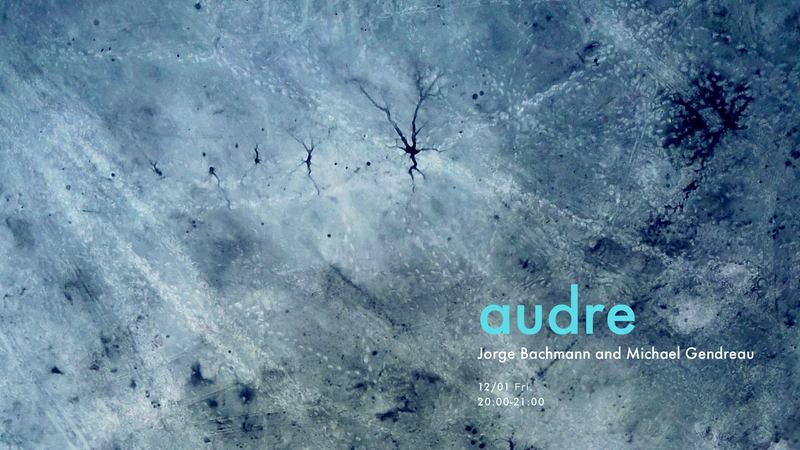 audre's creations are influenced by post-industrial, minimal and drone-music. Both members use modular synths, shortwave radio, turntables and field recordings to build a multilayered mixture of suffocating atmospheres and somber cinematic drones. Their sound cold be described as "Dark Ambient"
[ruidobello] is the project of San Francisco based Sound Artist Jorge Bachmann. He has been involved in San Francisco's experimental music/dance scene since the early 2000. Working across a wide range of explorations, Bachmann's work is eclectic, going from subtle "Musique Concrète" Soundscapes to analog modular synth minimalism. Since the early 1980's he has been exploring the strange, unique and microscopic sounds of everyday life. Collecting field recordings and creating immersive soundscapes. Blurring the boundaries between wilderness sound environments and man-made sounds. Bachmann has composed music for MOBU Dance troupe and is actively collaborating with Christine Bonansea Dance Company. [ruidobello] has performed and exhibited in North America, Europe, Japan, Taiwan and South America. In 2009 he performed his audio-visual piece, "Coleoptera", at the 10th Francisco Electronic Music Festival. In recent years he has performed and improvised with the likes of Alessandro Cortini, Bryan Day, Michael Gendreau, Mason Jones, David Graves, Danishta Rivero, Markus Hawkings, Yuko Matsuyama, Kevin Corcoran and Takahiro Kawaguchi. At present he is also part of "Collision Stories", "audre" and “Faults”. Michael GENDREAU started playing drums in 1972, and working with tape machines and scrappy electronics a few years after that. He has composed or co-composed for those instruments and others (turntables, notably) for various recordings and performances, both solo and in groups (Crawling With Tarts, Lars Mars Orchestra, rRope, Seitz Versus Gendreau, Speed The Parting Guest, The Disturbing Group, Collision Stories, etc.). After completing a degree in physics in 1989, he began work as an acoustician that continues to this day, where his primary focus is in the design of very quiet research environments, with respect to infrasound and vibration. In addition to work of a scientific nature, his bibliography also contains items in the philosophy of music and performance, including the 2010 publication of a book by Van Dieren Editeur (Paris) entitled Parataxes: Fragments pour une architecture des espaces sonores (or,The Commonplace Book of Parataxis) and in 2011 publication of an essay on using buildings in performance, “Concerted Structures,” in Site of Sound #2:Of Architecture and the Ear (Errant Bodies Press, Berlin). His discography, containing more than 150 documented items since 1983, is topped with a new CD by Collision Stories. In the last 15 years he has performed as a solo artist, mostly driving performance spaces with their own modal characteristics, in Belgium, England, Estonia, France, Greece, Latvia, Lithuania, Poland, Russia, Spain, Switzerland, Taiwan, Ukraine, and the USA.